Many of these places and artifacts are not only unknown to the Chinese themselves, but they also have the potential to re-write history as we know it. In this top list we examine some of the greatest ancient mysteries China has to offer. A mystery lies scattered on the unexplored bottom of Fuxian Lake, stretching out through Chengjiang County, Jiangchuan County and Huaning County in Yunnan Province, about 60 kilometers to Kunming City, China. The lake is rising 1,720 meters above sea level and encompassing 212 square kilometers of land. According to an ancient local legend, a city-like silhouette under the lake from the nearby mountains can be clearly seen on a fine, calm day. To find out if there is something hidden in the calm waters of the lake, a Chinese submarine archaeology team stationed in Fuxian Lake carried on surveys and with advanced use of detectors, discovered lots of blocks scattered on the lake bottom, stones that formed a wall seen on a sonar display along with various flagstones. High stairs appeared in front of them and flagstones covered with moss seemed to reveal an ancient sunken city. The team members found the scope of the site under Fuxian Lake was extremely big, and the traces of construction were everywhere along with earthenware. Could the underwater site be the ancient city of Yuyuan, which disappeared mysteriously many hundreds of years ago? They came from a distant place in our Galaxy. Their spaceship crashed on Earth. They were chased and killed by humans. Stranded on an alien planet they desperately tried to return home. They knew their existence was doomed and therefore they wrote down their story for others to read. They wanted to tell us who they were and what brought them here. They left a message for future generations, but the alien artifacts they left behind were hidden from the public! This story is known under a lot of names and it is one of the most covered-up stories in the history of extraterrestrial-human interaction. 3. 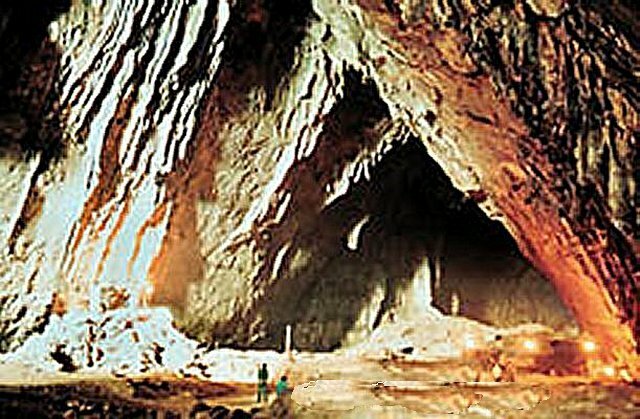 Mystery Of the Panxian Cave – How Could Gigantic Animals Reach A Mountain Cave Located Over 1600m Above Sea Level? Did early Homo sapiens exist in China at the same time when Homo erectus (the “Peking Man”) occupied Zhoukoudian site located near Beijing? The Panxian Dadong is a Paleolithic karst cavern located in a small valley 1630 m above sea level on the western Guizhou Plateau, Southern China. Humans were present at Panxian Dadong Cave about 300,000 years ago and so were also gigantic animals. But scientists are baffled over how these animals could reach a mountain cave located over 1600m above sea level! 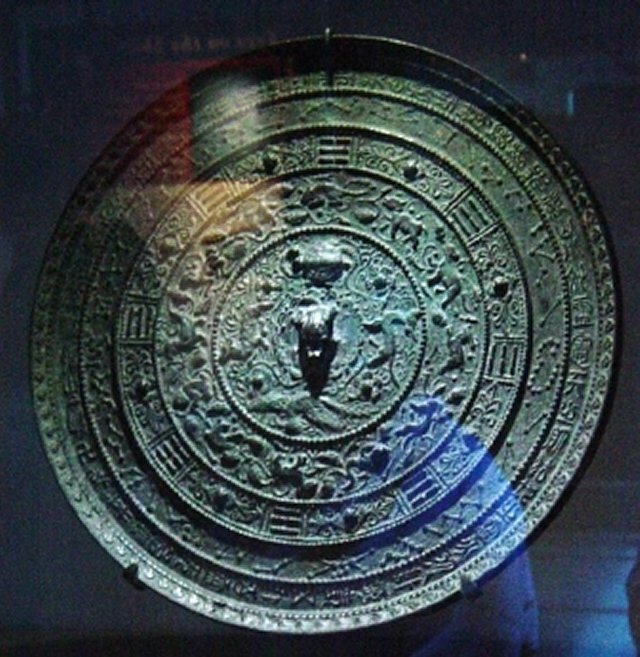 The so called ancient Chinese “magical mirrors” are some of the strangest objects in the world. 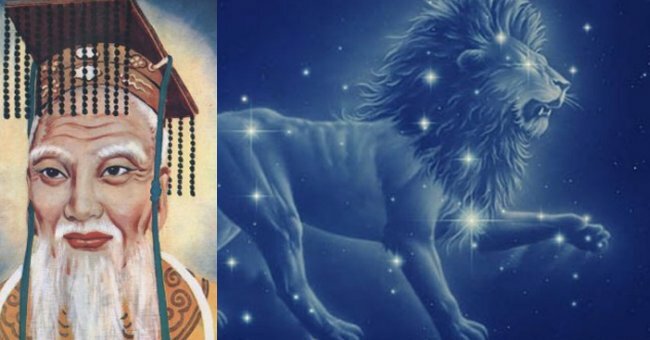 The exact origins of ancient Chinese “magical” mirrors are unknown. About 1,200 years ago, a book entitled Record of Ancient Mirrors still existed. This book contained the secrets of these enigmatic objects and their constructions. Unfortunately this book has been lost for over a thousand years. Today, we wonder what secrets lie behind the thousand-years-old “magical” mirrors that have the creepy ability to project patterns from the back when light is shining on the front? In ancient China there is one type of rare mirror called t’ou kuand ching, which means literally “light-transmitting mirror”. When a strong light strikes the undecorated polished front surface, and is reflected onto a wall or screen, the patterns decorating the back of the mirror mysteriously appear in the reflection. When magic mirrors came to the attention of the West in 1832, dozens of prominent scientists attempted to discover their secret. These remains are known as ” ET Relics” and no one knows their origin. 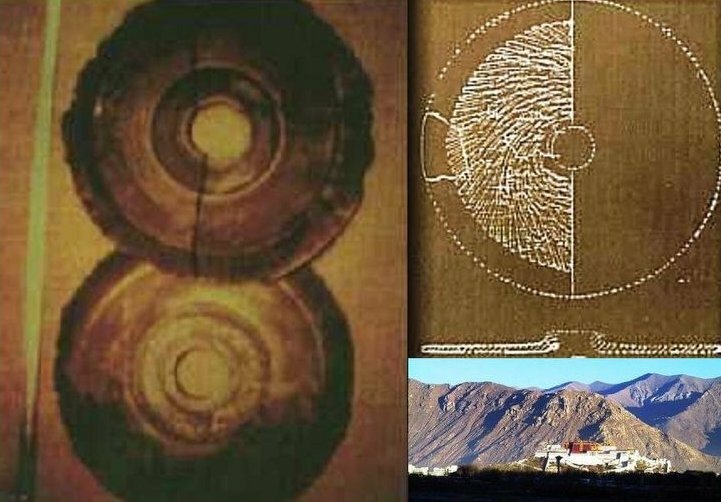 Did extraterrestrials once touch the ground of Mount Baigong (or Bayinnuowashan Mountain) located about 40 kilometers southwest of Delingha City and left mysterious relics of unknown origin? The area around the city is very isolated, but extremely interesting! 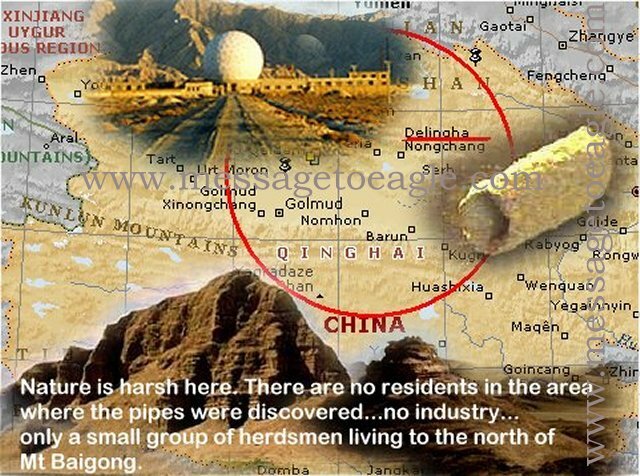 Ancient pipes that could be of extraterrestrial origin were discovered on, and around Mount Baigong located not far from the city. In 2003, a group of nine Chinese scientists traveled to Qinghai Province to closely examine the site. Isn’t it strange that the result of the close examination of these artifacts has never been officially published? Has any major research been done in the first place or has it been interrupted because the relics are in fact related to extraterrestrial visitations to the planet Earth? Is something intentionally kept from being published? A most mysterious discovery is the slope of the caves. The inclined plane of the walls has exactly the same slope as the outside hill. 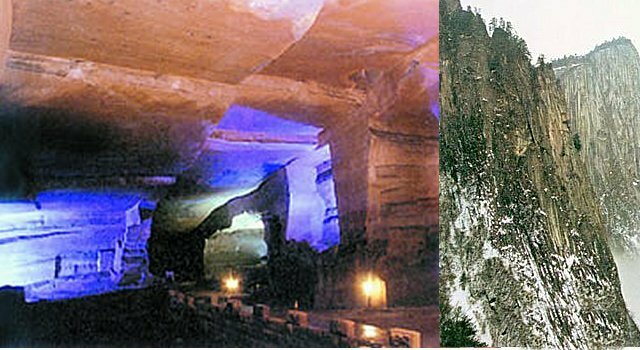 Is it just a coincidence or do certain laws of nature lie behind the phenomenon, reported by explorers researching the ancient Mystical Caves at Huashan, near the famous Huangshan Mountain in China’s Anhui Province. Yet according to the technology of that time, how could the ancient people have managed that? Located in the eastern suburbs of Tunxi district in the Anhui province city of Huangshan, a visitor will find Huashan Caves steeped in ancient, mysterious legends. The history and purposes of Huashan Caves – accidentally discovered by a local farmer – are now untraceable due to the lack of any words in books or on cave walls describing their use. The “Yellow Emperor” was a rather interesting entity. Huang-ti was very different from other ancient heroes. He did not enlighten people, did not demand worship. Huang-ti and his helpers were amazingly rational beings. Numerous sources relate that Huang-ti manufactured and used some “miraculous tripods.” The “tripods” were not used for water, nor was there any fire to heat and prepare food in them. The purpose of such a “tripod” was quite different: Who was the Yellow emperor really? 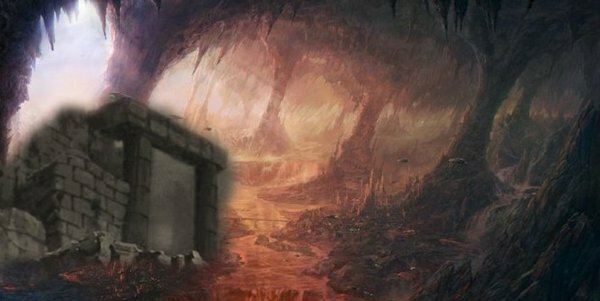 Ancient people believed that once you entered this place there was no way out. A very long time ago, there were houses and temples here. Today, everything is buried under the sand. 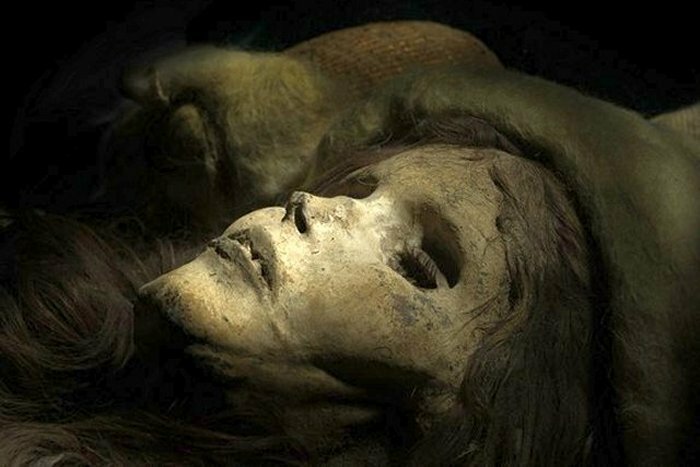 Precious ancient relics are hidden deep under the “Sea of Death”, or the Taklamakan desert. Archaeologists are beginning to discover some of the secrets that have been hidden in this mysterious region. Still, it seems that we are only scratching the surface and only time will tell what more wonders are waiting to be unraveled. The Taklamakan desert is the largest desert in China and it is also considered to be the world’s second largest shifting-sand desert covering an area of over 33, 700 square kilometers (over 13,000 square miles). According to an ancient legend, once a long time ago, a powerful Supernatural Being who saw the hardship being faced by the people in this area, thought that he could help them by using the two magic objects in his possession namely the golden axe and the golden key. 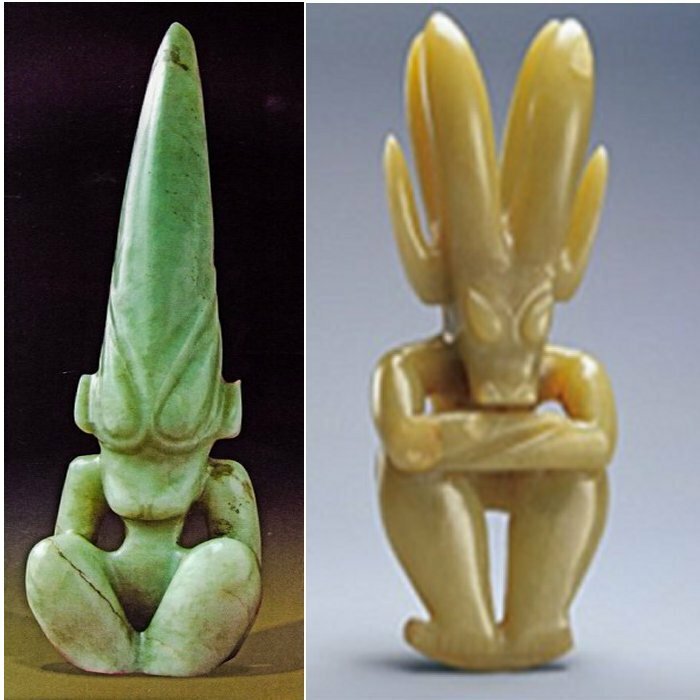 The mysterious ancient Hongshan culture vanished thousands of years ago, but they left behind a number of absolutely astonishing jade figurines that we have the privilege to admire today. Interestingly, some of the produced figures are very alien-looking. Whom do they depict? Did the Hongshan people encounter ancient aliens perhaps? There is no doubt that the Hongshan culture of ancient China played a vital role in the history of the country. The Hongshan people were dragon and fertility worshippers, as can be seen by looking at the produced artifacts. Several of the jade artifacts were discovered in tombs or near an altar. However, some of the figurines do not resemble any known creature or symbol. It is true that we have gained a lot of knowledge about the Hongshan people, but much of their spiritual and earthbound life is still shrouded in mystery. 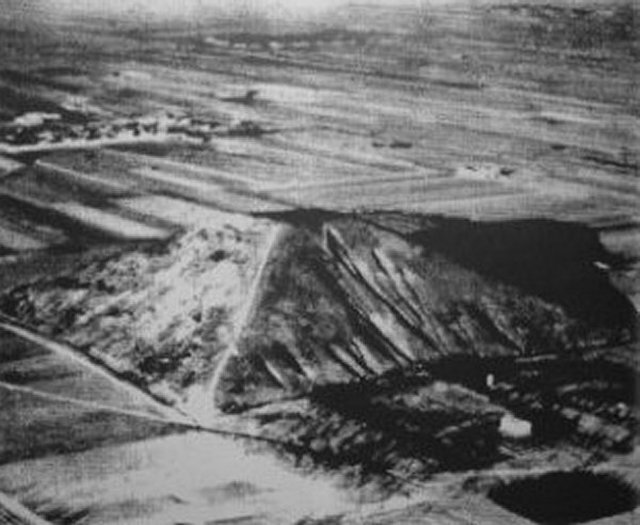 It is located about 40 miles southwest of Xian, the largest of sixteen pyramids located in the area designated as a Shensi, or a “no-go area”, a forbidden zone by the Communist authorities. These restrictions make it extremely difficult for Westerners to visit the pyramid and take photograph of it. Nevertheless, some people from West have actually managed to find a way to view this impressive structure. It is unknown when exactly the Great Pyramid of China was raised. According to some Chinese archaeologists the pyramid was built during the Hsia Dynasty from 2205 to 1767 B.C. Did prehistoric civilizations with advanced technology exist in the past?